Expats returning to the UK have a long journey ahead of them. It's important to consider which flight times and stop-overs suit you best. Plan what you need in your carry-on luggage for surviving nine or more hours. Travelling home for the festive season? We spoke with ICAS members Down Under to find out how long-haul business and home travel is best survived. Australia has long been a destination of choice for work as well as play, but the flights there and back are something ex-pats prefer to forget. With airlines introducing more options (Virgin Australia announced new flights between Melbourne and Hong Kong, and even Canberra now offers direct Singapore Airlines flights to Singapore and, from next year, to Doha with Qatar Airways) there is an endless selection of ways to approach one of the world’s longest routes. 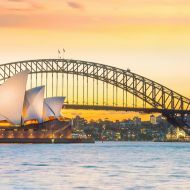 A recent report in Fairfax Media publications said there were almost 10 million overseas trips taken in the last financial year from Australia - a 100% rise on figures from a decade ago. Most ICAS members based in Australia make the journey several times a year for work, or to visit family during the holidays. We asked them for practical advice on surviving the trials and tribulations of terribly long flights. “Some airlines give you pyjamas in business class but even if they don’t, or you’re further down the cabin, change into pyjamas for your designated night leg. You will relax and sleep better, then enjoy getting into fresh day clothes on arrival. I pack a universal charger, pyjamas and a change of clothes, plus my running gear and a swimsuit and goggles. “Similarly, taking advantage of a shower option whilst in transit works for either freshening you up or helping you relax prior to the sleep leg. I pack a universal charger that allows me to charge in transit anywhere, pyjamas and a change of clothes in case of lost luggage woes, plus my running gear and a swimsuit and goggles. “The flights with Emirates that involve one stop to Scotland are excellent. Avoiding Heathrow by flying Sydney to Dubai to Glasgow can cut five hours off the journey. I watch with interest the non-stop flights that are commencing next year from Perth to London with Qantas. Avoiding Heathrow by flying Sydney to Dubai to Glasgow can cut five hours off the journey. It’s about the discipline of staying awake as long as you can for the first leg, then sleeping prior to arrival. “There is a flight from Sydney to Glasgow and the sun never sets during the flight! This is a result of flying westwards. It sets off at 6am and goes via Dubai. It arrives in Glasgow at 7pm. This connection only operates during the Australian summer when the time difference is nine hours. “As tempting as it might be, don’t indulge in free alcohol. It might help the sleep but you pay for it at the back end of the flight. Take a couple of sleeping tablets instead. Travelling in economy on 14-hour flights, I have found a sleeping tablet or two has made a big difference in arriving feeling rested.